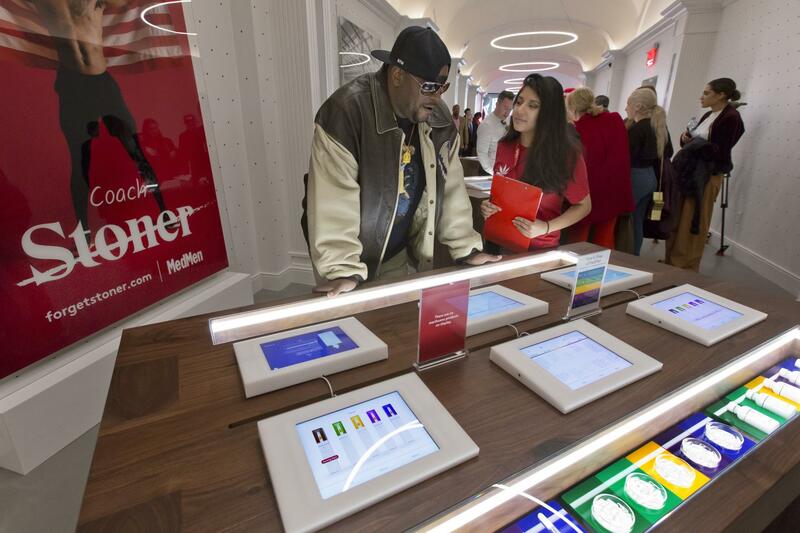 A customer at MedMen listened to an employee describe products in a store on New York's Fifth Avenue in 2018. Massachusetts is not the only state struggling to limit the dominance of large marijuana companies. Maryland bars companies from owning more than one store, but several companies have publicly said they have multiple outlets there. In what seems like an open defiance of the spirit of rules designed to level the playing field among competitors, Green Thumb Industries and iAnthus Capital Holdings Inc. both claim three outlets in the state. Wakefield-based Curaleaf Holdings, which already runs a medical marijuana dispensary near Baltimore, said in an investor presentation last month that it plans to have three additional stores operating there under its brand. Meanwhile, Harvest Health and Recreation Inc., a cannabis company with one store in Maryland, unveiled plans this month to buy Verano Holdings, which has two more. A Green Thumb attorney told the Baltimore Sun last year that it believes the Maryland rules only block companies from submitting more than one application for a new license from the state — and doesn’t bar companies from obtaning additional licenses from other companies. An investor presentation in March says it acquired two of its three Maryland licenses. In addition, the current Maryland law only focuses on ownership, in contrast to the broader language in Massachusetts law that also limits the number of stores companies can “control.” The Maryland focus on ownership has allowed firms to argue they are legally permitted to operate additional stores in Maryland they don’t own, but run under management agreements. An iAnthus spokesman said the company runs all three of its stores in Maryland, but does not own any of them. In December, the Maryland Medical Cannabis Commission expressed concern about a “proliferation” of management agreements, saying it had objected to at least a half-dozen that appeared to skirt state regulations. But the commission announced in January it will wait for guidance from the state’s Legislature before taking further action. One bill introduced in February would allow companies to own up to five marijuana dispensaries, a huge boost from the previous one-store limit. Los Angeles attorney Barry Weisz said there is a lot of ambiguity in state and local restrictions throughout the country, because the rules are so new and generally haven’t been tested in court. Weisz predicted the laws will be refined in the next few years, eliminating confusion about what the actual limits are. But in the meantime, companies will continue to test the limits. “It’s like the wild, wild west,” he said. The issue is playing out on the local governmental level, too. In Los Angeles, officials have banned entities from owning more than three retail marijuana licenses. 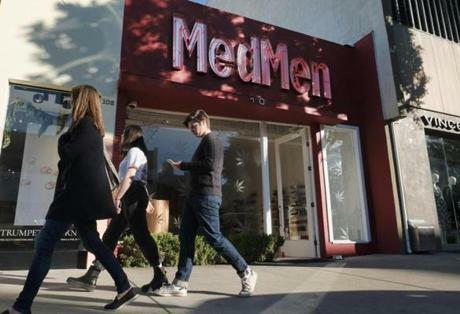 Pedestrians walked past one of the MedMen marijuana dispensaries in Los Angeles. Despite the rule, MedMen Enterprises Inc. operates five LA stores under its brand. The company insists that, technically, it only owns three, with the remaining two licenses held by a separate investment fund. However, the company acknowledges the fund — MedMen Opportunity Fund II — includes the company’s name, is based at MedMen’s headquarters, and was founded by the same people. Los Angeles officials said they are reviewing all of the city’s marijuana licenses for compliance with the license cap and other rules. Separately, in the New York state market, MedMen recently announced plans to buy another multistate marijuana operator, PharmaCann, which would give MedMen control of eight stores in New York if regulators approve the deal. Each company currently operates four stores in New York, the maximum permitted under state law. New York’s Compassionate Care Act, passed in 2014, says registered organizations may “operate” up to four dispensing facilities each. MedMen said it waiting for a ruling from regulators on whether it will be able to keep all eight New York stores. In another method of monitoring companies, Colorado bars publicly traded companies from investing in licensed marijuana businesses there at all, a restriction designed to make it easier to keep tabs on the owners of cannabis businesses in the state. But MJardin Group, which has publicly traded stock, told investors it operates seven stores in Colorado under the name Buddy Boy. A Mjardin spokesman said a separate entity actually holds the licenses, even though Mjardin operates the businesses. Some in the marijuana industry has pushed to eliminate the Colorado restrictions. Last summer, then-Colorado Governor John Hickenlooper vetoed a bill that would have let publicly traded cannibas firms hold marijuana licenses, saying it was premature and citing concerns about potential investment fraud. But Hickenlooper’s term ended in January and state lawmakers are considering a new bill to repeal the ban this year. Marijuana companies also have tried to thwart caps in another state. Kim Rivers, CEO of Trulieve, spoke during a panel discussion at the Benzinga Cannabis Capital Conference in Miami Beach, Fla. in January. Earlier this year, Trulieve Cannabis persuaded a Florida judge to strike down state rules capping the number of dispensaries each company can own there. The state has appealed the court ruling, but the cap is slated to expire next year. In December, Trulieve entered the Massachusetts market when it bought Life Essence, which has provisional licenses to open marijuana dispensaries in Cambridge, Holyoke, and Northampton. But Trulieve has expressed interest in adding additional stores beyond that. 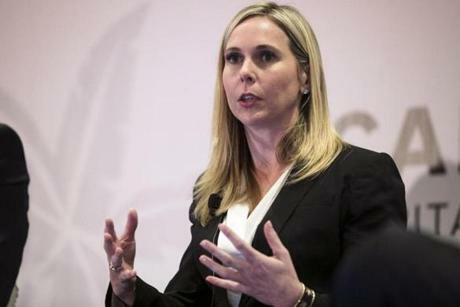 The company’s chief executive officer, Kim Rivers, told the Globe at a conference in Miami Beach in January that the company also was working with its lawyers to try to identify a legal way around the Massachusetts limits, such as asking the commission for an exception because it has a female CEO. “Our lawyers are looking at that,” she said.